The New Zealand avocado industry strategy is to produce a consistent volume of premium quality avocados. Maximising sales and values in all markets and successful development of new markets is highly dependent on providing our customers with fruit of high quality. An integrated approach to rot control will help mitigate risk factors leading to optimal fruit quality in export markets. Best practice guidelines take a comprehensive and integrated approach to tackle rots so as to provide the greatest likelihood of successful out-turn. For more information on mitigating fruit rots please download the fruit rot management chapter from the grower manual below. Copper is a protectant fungicide, which must be applied before infection occurs. Fungal spores will only be killed if they come into contact with the copper on the leaf or fruit. The spray will only be as effective as the coverage you achieve. Orchard hygiene – Remove potential inoculum sources to minimise the inoculum load on orchards. Remove mummified fruit, dead wood and dead leaves. Prune to increase airflow through the orchard. Tree health – Maintain fruit quality through optimal tree health. Ensure soil and leaf analysis is done to support decisions on nutrition. Research links calcium and fruit quality. Ensure adequate levels of calcium in the early stages of fruit growth (first six to eight weeks). Use the natural leaf litter under trees as this will promote slow release of nutrients into the soil and help maintain soil water content necessary for nutrient uptake. Ensure you have a healthy root system to maximise the uptake of nutrients. Harvest management – Avoid harvesting if more than 5mm of rain has fallen in the last 24 hours to reduce the risk of lenticel damage. Wet and turgid fruit are more susceptible to developing fruit rots. Picking should not commence until at least 2 hours after rain has stopped. The roll test determines fruit susceptibility to lenticel damage. Fruit rot history – Access library tray data for a comparison of your fruit quality against industry trends from season to season. The guide to interpreting library tray results is available on the industry website. As a rule of thumb if more than 25% of the fruit in your library tray sample have developed ripe rots or stem-end rots, then this fruit is likely to be contributing to “quality” problems. 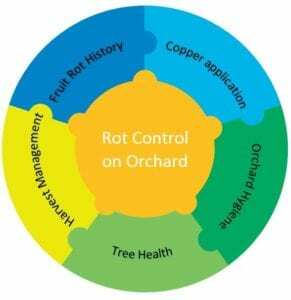 Share the post "Fruit rot management"